Our research is committed to problematizing taken-for-granted practices that influence how contemporary moving bodies are understood. We aim to promote positive change by examining the possibilities of practising sport and physical activity in more ethical and healthy ways. 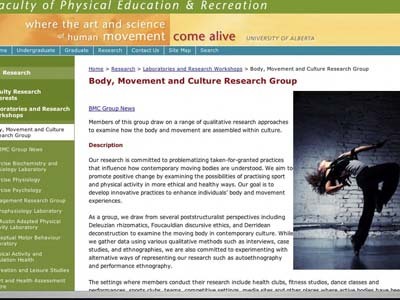 Our goal is to develop innovative practices to enhance individuals’ body and movement experiences. As a group, we draw from several poststructuralist perspectives including Deleuzian rhizomatics, Foucauldian discursive ethics, and Derridean deconstruction to examine the moving body in contemporary culture. While we gather data using various qualitative methods such as interviews, case studies, and ethnographies, we are also committed to experimenting with alternative ways of representing our research such as autoethnography and performance ethnography. The settings where members conduct their research include health clubs, fitness studios, dance classes and performances, sports clubs, teams, competitive settings, media sites and other places where active bodies have been shaped and formed through a number of discursive practices.